The Optimass 1000 is designed for the chemical, petrochemical, food and beverage, water and pharmaceutical industries. KROHNE has announced it has begun manufacturing the updated OPTIMASS 1000 Straight Tube Coriolis Mass Meter at its newly-opened flow and level instrument manufacturing and calibration facility in Beverly, MA. The Optimass 1000 is designed for the chemical, petrochemical, food and beverage, water and pharmaceutical industries and can operate between -40 and 130° C.
It is designed with a close-coupled twin tube configuration with an optimised flow splitter, manufactured to be durable and capable of handling flow rates, despite pressure fluctuations. This product also offers hygienic process connectors for the pharmaceutical and food and beverage industries and comes with a standard measuring tube that is 100% accurate, ensuring the highest level of safety. The updated meter features certain elements of the Optimass 7000 series, such as a high level of performance in density and mass flow. It has been designed without installation restrictions and remains unaffected by vibration and hydraulic noise interference. 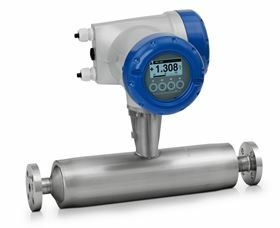 The Optimass 1000 uses KROHNE’s modular electronic converters, which can be fitted across a range of flowmeters. It can also be fitted with most industry standard hygienic connectors and DIN, ANSI and JIS standard flanges. New biogas version of Optisonic 7300 will be on display.